Mr Caribbean 2016 live | ComeSeeTv Broadcast Network ... Can you See me Now! Watch the Mr Caribbean 2016 Competition live! 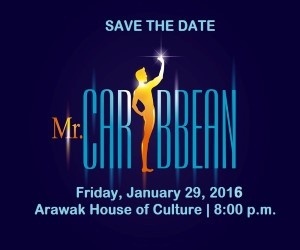 The 2nd Annual Mr. Caribbean competition will be held on Saturday, January 29, 2016 at the Arawak House of Culture in Dominica at 8:00 p.m.! The show will feature contestants from Antigua & Barbuda, Barbados, Dominica, Dominican Republic, Grenada and Guyana, Contestants will compete in talent, swimwear, costume, formal wear and interview segments. Don't miss it!